A good friend had her first grandchild many years ago. This boy, now well into his teens, is extremely bright. His grandmother has entertained me with “Davy” stories since the minute the child began to speak. Perhaps my favorite story is one that happened in December when the child was eight. Each year my friend would select gifts for Davy and each member of his family at Christmas. This particular fall, Davy’s mother had given birth to twin boys. With another child in between, my friend found her time becoming less and less as she helped care for her daughter and the growing family. The time she usually spent shopping, baking, and preparing for special activities dwindled to almost none. Shortly after Thanksgiving, she sat her grandson down for a little chat. He nodded his head, but offered no comment. Again his head bobbed up and down, processing her words, but he never uttered a sound. Simply putting this story down on paper brings a smile to my face. How often do I read the Bible believing and accepting each verse, yet when it comes to the day-to-day practicing of God’s Holy Word, what difficult tasks loom before me! Forgive seventy times seven? Love your neighbor as yourself? Do not covet? Pray for your enemies? Need I go on? As a child I was taught these values and have never doubted to this day their truth and importance, and after leaving church or completing my morning devotional, I am armed with the Spirit of Jesus Christ, ready to face the world and witness as a Christian through my words and actions. Once into my routine, however, the living out of these tenants becomes a big challenge. Too often my “humanness” rears its ugly head. Like Davy, I feel more Christian in theory—when things are going my way, when life is comfortable, when the road is smooth. But it’s the potholes and unplanned detours that test my faith and make it meaningful, and consequently make me a stronger Christian. Just as my friend’s love for her grandson Davy didn’t diminish when she had to cut down on his Christmas presents, God’s love for me doesn’t lessen with the circumstances. No matter how far I stray from the ideal, I know that God will forgive me each time I ask. Through the gift of His Son, I have the blessing of unconditional love, and that’s the best gift of all. Janice Alonso is a writer from Alpharetta, Georgia. Visit her website at http://www.janicealonso.com. “For God so loved the world, that He gave His only begotten Son . . .” (John 3:16 KJV). Perhaps, as I did, you learned this as your very first Bible verse. Many children continue to quote, sing and memorize this familiar passage of scripture. Although it gives a powerful declaration of God’s unconditional and divine love toward humanity, it sometimes created emptiness within me. Meditating on this scripture opened my eyes. I realized that too often I unconsciously excluded the “me” from the “world” which God so loves. Jesus didn’t die for the physical elements such as the stars, moon, and the earth with all their splendor, but He died for me. However, many fail to experience His love on this personal level. The Scripture warns that we must walk by faith and not by sight (1 Cor. 5:7). This also means that we are to avoid trusting in our wavering feelings. God certainly declares His love for us throughout the Bible, and yet we allow our varying emotions to cause us to doubt Him. “God, I know you love the world, but what about me?” This question haunted my mind during a spiritual season of dryness. It resounded despite all my efforts to push it aside. One day the following incident occurred and brought an end to my ambivalent feelings. I had purchased many used books over the years at a local flea-market shop. On this occasion, the owner stopped me as I was leaving stating, “I thought you might like this. You are such a good customer, I want you to have it.” He presented me with a with a music box shaped like a Bible. The owner, Lanny, had no idea that he was being used as an instrument to minister reassurance into my life. You may call this a mere coincidence. I call it divine orchestration. I believe it took God’s precise timing to have the right music box, with the right song, at the right place, to be received at the right moment, by the right person. How often do we miss God’s personal messages of love sent our way? Perhaps they are just blotted out by the everyday commotion of surviving. How many opportunities have you missed to be used as an instrument to fulfill His divine will? There are many today who are searching for tangible affirmations of their Heavenly Father’s love. Can He use your tongue, to speak a word in season to one who is hurting? Can He use your hands, to render a kind touch to a wounded spirit? Can He open your heart, to give a gift which may have some special significance, unknown to you? Let us make a concerted effort to flow in harmony under His masterful direction. Then the earth will be blanketed with a divine symphony decreeing God’s love for the world, His love for you . . . His love for me! Jeri Darby is a freelance writer from Bay City, Michigan. I couldn’t get my sixty-two year old mother off my mind on Christmas Eve. She lived over a thousand miles away and there was no way I could leave my husband and two young children to ease her loneliness on her first Christmas without Dad. But we each talked to her by phone before she went to the nearby shopping mall to do some last minute browsing before attending the Christmas Eve church service at seven. After we returned from church, our family watched Charles Dickens’s A Christmas Carol on TV. I thought about Mom—and prayed for her to have an unexpected surprise that would make her holiday special. Her town was friendly, and most people knew one another. She could have a peaceful time at the mall chatting with others. She would visit with people after church, too. But I knew she would miss Dad and shed some lonely tears. I hoped the tears would be few and smiles would replace them. I awakened early on Christmas morning. I phoned Mom, knowing she would be awake early for her devotions. We realized that God’s love links His people—and Christmas is cheered for the lonely wherever love is. Jesus said it clearly. “My command is this: Love each other as I have loved you.” (John 15:12, NIV). Audrey Carli is a freelance writer from Iron River, Michigan. Young children quickly learn what pleases their parents and what does not. When my son, Laurence, was a little boy, he could sense when I was upset because of a mistake he made. Shortly afterwards, he would search for a small piece of paper about the size of a postcard and write on it, “I love you, Mom. Love, Laurence.” Then he would find me and give it to me. I was moved by the gesture and by the thought behind the words. We would hug, exchange verbal “I love-you’s,” and move on. All children make mistakes. It is an intrinsic part of childhood. Even as a child of God, I will continue to make mistakes. Fortunately, God is the perfect parent. If I hurt Him and then tell Him in my heart that I am sorry, He will forgive me. Because He is perfect, He loves me unconditionally, whether I am sorry or not. Still, just as Laurence showed his love for me through his notes, I want to show my love for God by offering my actions as “I love you” notes. There are so many ways to show God that we love Him. Sharing with others our time, words of encouragement, talent, and resources pleases God. Forgiving those who offend us, interceding in prayer for others, obeying God’s commandments, keeping our hearts pure, praying for those who persecute us, loving the unlovable, being grateful, loving our enemies, enjoying nature, setting a good example, being kind, being patient, staying away from the appearance of evil, and bearing one another’s burdens are some of the “I Love You” notes we can write for God. I am not a sentimental person, but I kept all of Laurence’s “I love you” notes. They are so precious to me. Laurence showed that he loved me through his little notes. My son is a teenager now. Writing “I love you” notes to his mother is no longer his thing, although I know that he still loves me. He has different ways of showing it as his childhood gives way to adulthood. No matter how old we are, even if God blesses us with 80, 90, or 100 years of life on earth, we are still children in God’s eyes. We can still bring a smile to His face by giving Him “I love you” notes. Why not give Him one today? Heidi Loiseau is a freelance writer from West Haven, Connecticut. Every day the sun rises and sets. Each year winter gives way to spring, spring leads to summer, summer yields to fall, and winter chases away the fall again. Moisture rises on the wind and falls back to earth as rain or snow. The cycles of nature are a testimony to our Creator’s constancy. The blessings we receive are also a testimony of God’s love for us. We often remember those blessings during the holidays as we gather with family and friends. But true love involves more than just blessings. Sometimes love needs to scold, correct, or punish. Sometimes it has to allow pain for our own good. While we are in the midst of trouble, we may not see the love, but when we come through it, often we have gained a new perspective. Look back on the past month, year, or several years and try to recall how has God demonstrated His love to you. Write down what you remember, and then make a collage of pictures, either from your personal photos or from magazines, to commemorate the evidences you have seen. Hang up your work as a reminder of the One whose love for you is perfect—constant and unchanging—because He Himself is LOVE. When my youngest daughter was scarcely three, she’d try to take over navigation while I was driving. With her wee toddler legs dangling over the edge of her car seat behind me, she’d question whether I really knew where I was going. She’d boldly advise me as to what she felt was the correct route. At times she’d doubt that I was following the rules of the road appropriately. This seemed hilarious coming from someone who was just three feet tall, couldn’t read, and had not yet mastered the skill of turning a doorknob. My tiny child thought that she could get herself to where she wanted to go, as if I were a part of the car and not the one in control. Our lack of trust in our Heavenly Father is not unlike that of my little backseat driver. I imagine God must roll with laughter at us, too, as we try to maneuver Him our way and question His course of direction. We make things hard on ourselves by trying to drive our lives from the backseat, where we have no way of seeing what’s ahead or knowing our destination. Our arms are not long enough to steer and our legs are too short to control the pedals. We need our all-powerful, all-knowing Heavenly Father to guide us and provide for us. Compliant behavior is so against our human nature that God provided us with the capacity to submit through His Holy Spirit. Our lives have so much more purpose and peace when we accept the control and guidance of our loving God. Once we put our full trust in Him, we can take our rightful place in the back seat and rest assured that our Heavenly Father is plotting the perfect course for us and steering us safely to our final destination, eternity with Him. Sheri Del Core is an inspirational writer who lives on the central California coast. Her greatest passion is studying the Bible. She has worked in both the children’s and women’s ministry fields and as a counselor with the Santa Cruz County Pregnancy Resource Center. How often had Johnny heard that said as his older brothers tried to protect a prized toy or we moved something breakable to a higher shelf? As adults, others may put things out of our reach, but are we “little Johnnys” also? Have we decided not to use and enjoy the gifts God has sent us, postponing happiness until all is in order? What are we waiting for? Our ship to come in? Retirement? Or do we put off having fun until the housework is caught up or the yard work done? Why can’t we make room for joy every day? My friend lies in a hospital intensive-care unit, clinging to life. Yesterday, the doctor said she has two more days unless they can bring the infection and resultant raging fever under control. She had no warning. An accident with multiple fractures led to surgery, followed by breathing difficulty. A lot of trauma for a woman who, statistically, should have twenty more years on this earth. We pray for the miracle that will bring her back to health and give her the chance to live life to the fullest. While we wait, we reach for the treasures we had put aside for tomorrow. Martha J. Morrison was a freelance writer from Candor, New York. Susan Joy Clark is a freelance writer from Verona, New Jersey. She enjoys singing in her church choir and working with teens and children in a church puppet ministry. She is the author of the juvenile novel, And the Violin Cried. A Woman After God’s Own Heart, by bestselling author and speaker Elizabeth George, focuses on what it means to become a “woman after God’s own heart who will do all His will.” The book discusses the many facets of a woman’s life and her many roles, showing how a rich personal relationship with God can manifest itself in daily life, including relationships with husband, children, friends, and others. Written in a personal style, this practical, encouraging, and inspiring book delivers truth and recommends achievable steps for women in all walks of life. Author Amy Hammond Hagberg brings 34 celebrity reflections on God to readers in How Do You Know He’s Real? : Celebrity Reflections on True Life Experiences with God. Released in April 2006, the book is filled with stories to uplift, inspire, and encourage readers to reflect on his or her spiritual relationship with God. Jessica Burkhart, was a college senior majoring in English and had published over fifty pieces of her work in magazines when she wrote this review. “A Time for Reflection” was taken by freelance writer and photographer Rick Leland. 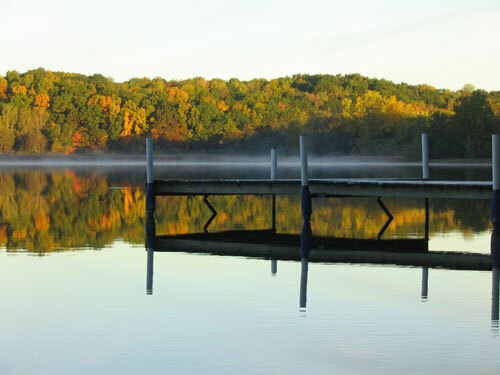 Just as the trees and dock are reflected in the lake, God’s loving faithfulness to us is reflected in nature. Let’s keep our eyes open to see those reflections.